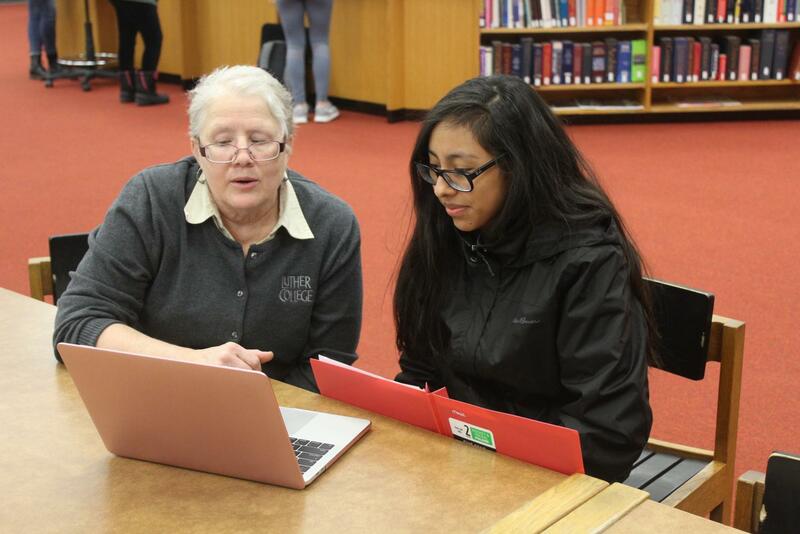 Professor of History Jackie Wilkie helps Lorelayn Coto ('21) with research for Paideia. Professor of History Jackie Wilkie and Associate Professor of History Edward Tebbenhoff will retire after the spring 2018 semester. The history department is planning on hiring at least one new tenure track professor as a replacement. During her 30 years at Luther, Wilkie served many different roles such as working to found the women’s studies program, serving as Paideia Director, leading study-abroad courses, and collaborating with local middle schools and high schools in coordinating National History Day projects. Tebbenhoff also reflected fondly on his time at Luther, where he helped develop the museum studies department, studied history, and encouraged students to pursue their interests beyond college. After the end of the academic year, Wilkie and Tebbenhoff plan to stay in Decorah. Wilkie will teach summer courses at Luther as well as the Paideia 450 course, Making Decision for U.S. Schools in Hawaii in January 2019. Tebbenhoff plans to continue researching early American history. Wilkie and Tebbenhoff have has a positive influence on Assistant Professor of History of Anna Peterson personally. Anika Nelson (’19) commented on her experience in Tebbenhoff’s April 1865: The Civil War Ended class. 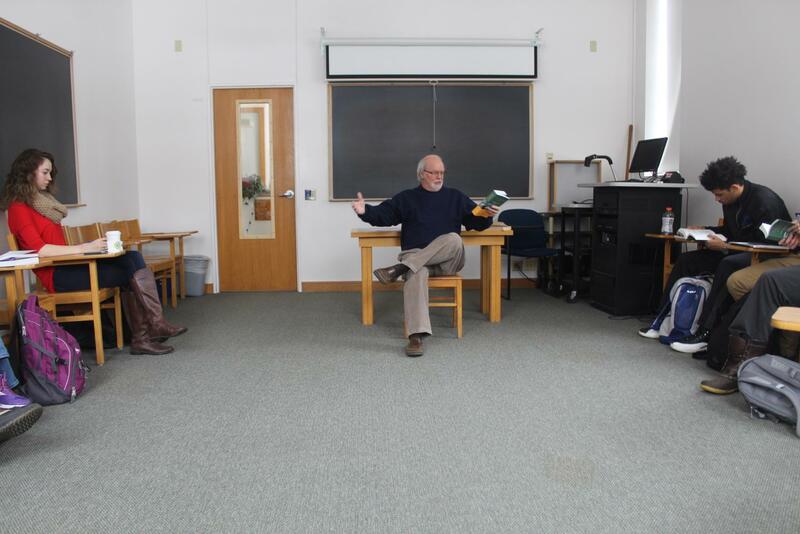 Associate Professor of History Ed Tebbenhoff leads a discussion during class. Associate Professor of History Victoria Christman explained the effect Wilkie and Tebbenhoff’s research has on the department. According to Associate Professor of history Robert Christman, Wilkie and Tebbenhoff played an important role in his time at Luther. “[Wilkie and Tebbenhoff] were really the two key players influencing and helping me to adjust to Luther and understand how it worked,” Robert Christman said. Wilkie and Tebbenhoff are the majority of American history professors at Luther and their retirement may affect future students. “We value a strong American history program here because that’s what our students are interested in,” Robert Christman said. The department is currently undergoing a search for a jointly appointed tenure-track position in Africana Studies and History. The individual hired for this position will fill some of the U.S. history courses and potentially teach first-year Paideia courses. The history department also has approval to hire additional part-time employees to teach U.S. history courses in order to meet the requirements for history and education majors. The loss of two American history professors could pose challenges for education students to meet the history course requirements for state licensure, but according to Assistant Professor of Education Dean Vesperman, education faculty are not worried. Head of the History Department and Associate Professor of History Brian Caton said authorization of additional searches for tenure-track faculty is in the hands of the administration. “If we’re not authorized to do it next year, then we will probably continue to hire part-time faculty to ensure that we have adequate courses in U.S. history until such time that we are authorized to do another [tenure-track] search,” Caton said. The history department, along with the education and Africana studies departments are continuing to look for the best way to proceed. “We’re making plans for the transition and trying ensure that we do service to the other departments that we have relationships with, to the student body, to the college, and to the legacy that [Tebbenhoff] and [Wilkie] are leaving behind,” Peterson said.